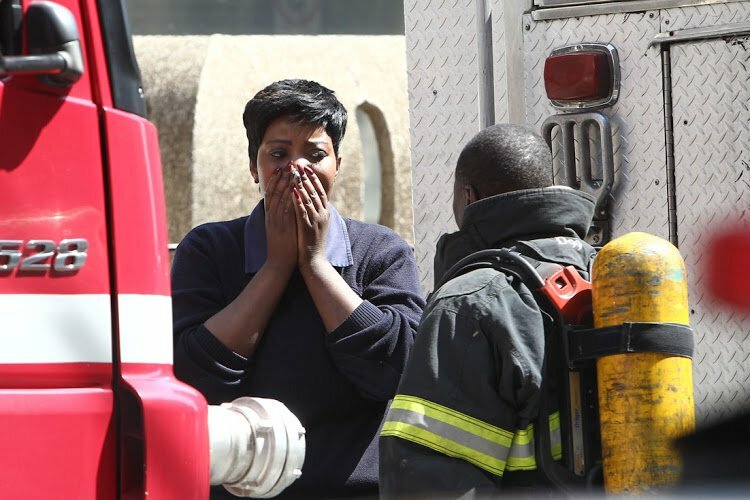 Three firefighters have been confirmed killed in the Line of Duty at the hi-rise fire in the building that houses the Department of Health in the Johannesburg on September 5, 2018. This is how eyewitness Mandla Ngcobo described what happened in the seconds leading up to the death of a Johannesburg Firefighter who fell from the 23rd floor of a burning building. Ngcobo was standing outside the building‚ watching as the terrifying scene played out above his head. From where he was standing‚ Ngocbo said it appeared that the firefighter had tried to use his body weight to break the window and get to a ledge outside. “I think he went with the elbow first time‚ and then he went for the second time‚ [then] he went full force with his body‚” said Ngcobo. Three firefighters have been confirmed dead‚ including the man who fell from the building. The bodies of two who were trapped inside‚ were removed from the building on Wednesday afternoon. Their names have not yet been released. Several firefighters and civilians were reportedly trapped on a ledge on the outside of the building‚ with other civilians on the roof. By Wednesday evening‚ attempts to rescue them – including with a helicopter – were unsuccessful. Ngcobo described the moments immediately after the man’s body hit the ground. “One of the paramedics…when she went there [to the body] she just dropped everything and just ran away crying‚” he said. Ngcobo described the scene as “horrible”. “You can imagine from the 23rd floor… It’s traumatising. Everyone is traumatised‚” he said. Dumisane Makamu‚ who works across the road from the building‚ said some thought that a stack of paper had caught fire. Later he became scared when he realised the extent of the blaze. Sylvester Kenny was at his desk in a building around the corner when the fire broke out. He said there were visible flames on one side of the building‚ but there was smoke all around. Later‚ he heard and saw people running and screaming. “Some people inside were running away‚ because someone fell out of the building‚” he said. Meanwhile‚ Johannesburg mayor Herman Mashaba said he would be visiting the families of the dead firefighters on Thursday. He pledged the city would do everything it could to assist the families. “Our firefighters in Johannesburg regularly have to face life-threatening situations‚ and continue to demonstrate their bravery in their efforts to keep our residents safe‚” he said. Firefighters are trying to contain a blaze that broke out hours ago at a printing factory in Kya Sands in Johannesburg. Mashaba made reference to the fact that the building was not up to code – comments that echoed those by Gauteng infrastructure MEC Jacob Mamabolo‚ who said that the building was just 21% compliant with occupation‚ health and safety standards. Ideally‚ he said‚ buildings should be 85% compliant. “The efforts to put out the blaze were hampered by a lack of sufficient water pressure in the building‚ which is an important safety requirement in a building of this size. It is reported that several government officials who evacuated the building have referred to unsafe conditions in the offices. “We regard these matters very seriously‚ given that this fire has led to the tragic loss of life of the three brave firefighters‚” said Mashaba.